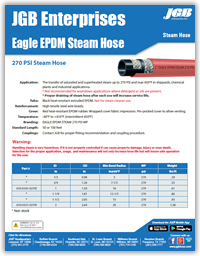 Eagle EPDM 270 PSI Steam Hose - JGB Private Brand - Hose by Vendor - JGB Enterprises, Inc. The transfer of saturated and superheated steam up to 270 PSI and max 450°F in shipyards, chemical plants and industrial applications. * Proper draining of steam hose after each use will increase service life. * Not recommended for washdown applications where detergent or oils are present. Handling steam is very hazardous. If it is not properly controlled it can cause property damage, injury or even death. Selection for the proper application, usage, and maintenance will not only increase hose life but will insure safe operation for the user. Black heat-resistant extruded EPDM. Not for steam cleaner use. High tensile steel wire braids. Red heat-resistant EPDM rubber. Wrapped cover fabric impression. Pin-pricked cover to allow venting.